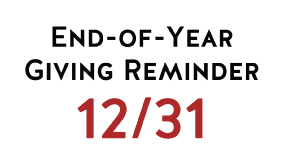 Year-end gifts fund our mission of transformation. Every dollar given brings transformation in the corridor and beyond. Pray for large, generous hearts to help us finish 2018 with a surplus of resources to be used for more transformation. For gifts to be counted in the 2018 tax season, they must arrive in the office by 12/31/18.